This 10 video course is designed by the American Video Language Institute for both classroom and individual use. Features Blip and Blab, the "language explorers" that can help your children learn standard spoken American English. Blip and Blab children's English video program makes learning fun! This brand new and innovative program was designed by ESL experts together with respected entertainment producers. Together, they have created a learning aid that effectively teaches while maintaining attention span and enthusiasm. And most importantly - this series works! The 10 included Blip and Blab videos can be used by any non-native English speaker. Each video contains 30 minutes of fun language learning programs designed to hold the interest of children of all ages and nationalities. Similar to The MuppetsTM in its presentation and layout, children will want to watch these videos over and over until they have memorized all the presented English vocabulary. Blip and Blab incorporates an intrinsically designed educational curriculum that teaches English with high powered musical entertainment. Children will have fun while learning. They are more apt to repeat viewings to maximize new language retention. Basically, Blip and Blab utilizes the Immersion Method of language training and allows the student to see, hear, and interact while the action keeps them wanting more. The main storyline is built around two fun-loving aliens named Blip and Blab who are visiting Earth from a distant planet to learn English. While they are studying, they get involved in many zany adventures with Earth children. Blip and Blab start with the basics - numbers, letters, colors, adjectives, et cetera, and then advance to conversational English and more complex structures. Filled with music, fun, and colorful animation, Blip and Blab is an out-of-this-world approach to learning English as a Second Language for children. This course is essential for every ESL program or individual looking for a convenient and entertaining way to give their child a head start learning English. This product has been previewed and is highly recommended by the staff of ESL.net. 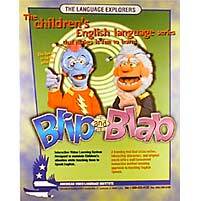 Children meet Blip and Blab and start to teach them English. 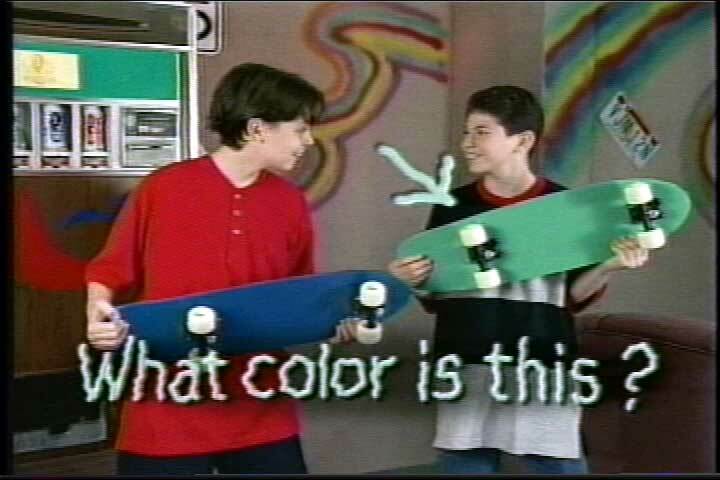 The episode teaches colors, numbers, sizes, and time in humorous, unexpected ways, and includes 3 songs that will keep kids glued to the TV. While they are helping, Blip and Blab learn conjugations, genders, verb forms, and positions and adjectives in a series of songs, dances, and unexpected adventures. We learn about the family and daily activities like sleeping, getting dressed, breakfast, going to school, dinner and cleaning up. In between fun, Blip and Blab learn more about positions and new verb forms. Blip comes up with a movie camera and the children start to make their own production. Through a whole range of movie situations and adventures, we take in verbs, question forms, and much more. 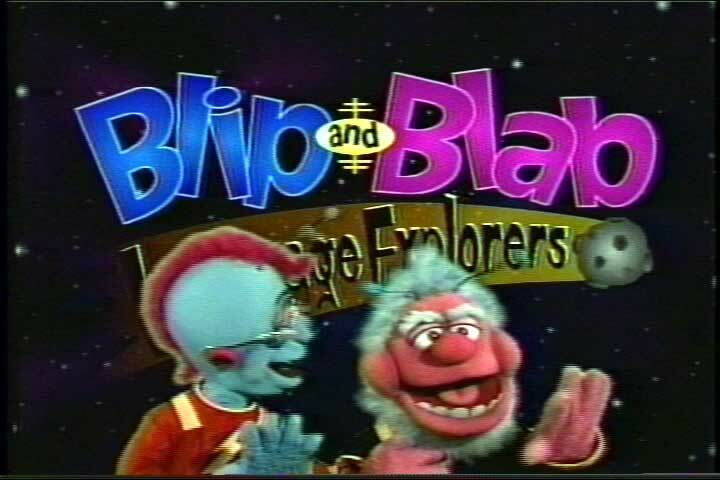 Blip and Blab find out about the past tense and, with the help of a time machine, travel back to the time of the dinosaurs and cavemen. A trip to the future completes their learning adventure. Now it's time to learn more about past tenses and irregular verbs, by meeting Sherlock Holmes and turning into detectives. But the mystery turns out to have a perfectly innocent explanation. This episode is all about the weather and activities connected with the seasons. 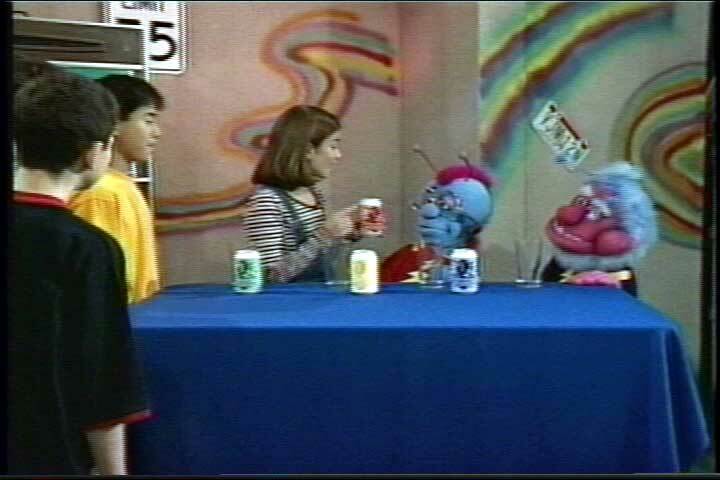 Blip and Blab learn about object pronouns, and discover the months of the years and the days of the week. When Blip and Blab take the children camping, they get into all kinds of amusing adventures. But there's still time to learn about future tenses. Another camping trip? The children would rather watch TV! Anything can happen on the Blip and Blab show! Songs, a hypnotist, talent spotting, a beautiful woman - even a bear gets in on the act! But there's also some learning, with comparative forms of adjectives. All the songs from the entire series are compiled in this episode, which gives children a great opportunity to recall what they've learned and practice it for themselves by singing alone. 10 episodes (entirely in English). Perfect for ESL or EFL Students at the Lowest Pricing Ever!